The days in La Paz were fun and seeing the whale sharks was incredible. The 6 days of kayaking and camping around Isla San Jose was out of this world. Beautiful camp spots where I could have spent the rest of my life gazing at the stars. The sunrise every morning and sunset every night was picture perfect. The campsites they chose were out of a movie, true paradise. I loved how remote the area was. We didn't see any other people other than a few local fisherman the entire week we were kayaking our way around the island. The waters were so clear and we saw marine wildlife everywhere we looked- turtles, stingrays, mantarays, dolphins, sea lions, whale sharks and so many beautiful fish I could never list them all here. The guides were happy to take us on whatever activity we wanted, and spent time beyond just the daily kayaking with us to ensure we had the adventure of a lifetime. They also gave me great pointers while we were on the water every day, so my paddling technique improved each day, and made the miles of paddling much more enjoyable with the ease of the techniques they shared with us. The food that was prepared for us each day was some of the best of my life. Traditional family recipes from the guides that ensured I got a real taste of Baja flavor. Hiking, snorkeling, and even accompanying our guides on spear fishing adventures were some of the amazing activities we did every day. Ruben, one of our guides would spear fish for our dinner and then the three of them would make us fresh sashimi on the beach with the snapper and parrot fish he caught! WOW! Thank you to Guillermo, Ruben, and Guerro for the most incredible trip I have taken in a long, long time. You guys are amazing and made this week one that I will remember for the rest of my life. I can't wait to take another trip with ROW, and more than that, I can't wait to come back to Baja and take another adventure with all of you! We recently took the Orca Base Camp trip with Sea Kayak Adventures. It was amazing. Yes its camping. We were well taken care of and got to paddle in this pristine area for 4 days. The beautiful scenery and wildlife did not disappoint. Passing Humpbacks, Sea lions, a playful otter, eagles, Orcas, etc. The guides took very good care of every detail of the trip. We would just relax and enjoy the experience. This was our 6th Row Sea Kayak Adventure and we loved it. The guides were well versed in the local history and natural biology of the area. We had fun learning about the area. I had read the book ORCA prior to the trip which made it more fun to see the places and animals featured in the book. Overall, awesome. Beyond my expectations with an abundance of wildlife, professional, knowledgeable and friendly guides, amazing food, spectacular scenery and clean stand-up tents that can accommodate 2 people. We saw a super pod of Orca, many humpbacks of which we watched from our beachfront camp site breaching and having a good ol time frolicking in the waters, steller sea lions, a school of dolphins, and bald eagles flying overhead. The morning starts with breakfast, paddling for a couple hours, a lunch stop, then padding to the next campsite, dinner, stunning sunsets and land games. You can hike if you want. We had a wonderful group of people on this excursion. I highly recommend this trip!! Ty Daniella, Colin and Lucious (our tour guides) and Row Sea Kayak Adventures for an experience I’ll never forget. From guides, meals and travelling companions, everything was fantastic. Mother Nature was at her best too. Weather was perfect. We encountered too many whales to count. The entire experience was excellent. This is a trip I had been dreaming about doing for years, and it was somehow even more amazing than I ever could have imagined. If you have the time, I highly recommend the 6-day trip vs. the 4-day trip because once you are out there, you won't want to leave. We saw an incredible amount of wildlife, including seeing whales daily. We saw humpback whales, orcas, porpoises, dolphins, seals, sea lions, eagles, bears, and a sea otter. Even when we weren't out in the kayaks, we saw whales and other wildlife constantly from the campsites. The trip consists of about 4 hours of kayaking a day, broken up by a lunch break half way through. Don't be afraid if you don't have much experience kayaking, the guides are very helpful and most of the kayaking we did was a relaxed pace that non-kayakers could handle, and the water was calm with a few exceptions. If there was a strong current or choppy water, the guides were always there to help. After kayaking, we would spend the afternoons/evenings relaxing at camp with wine and delicious food while watching all the whales and other wildlife pass by. The guides cooked DELICIOUS food and are very accommodating of any dietary restrictions. I am vegan and there was always plenty of food for me. The guides even made me a vegan lasagna one night! Our guides, Mel and Jon, were super knowledgeable of the area and all the wildlife and were a joy to spend time with. The camp sites consist of very spacious, full-height tents that you can stand up in. There are also toilets on site. I highly, highly recommend this trip! It is a once in a lifetime experience. I had very high expectations going into this trip, and it was somehow way better than I ever could've imagined. If you love wildlife, kayaking, and/or spending time outdoors, this trip should be at the top of your list. Our trip was the last week of August and we saw whales and other wildlife almost constantly every single day: orcas, humpbacks, porpoises, dolphins, sea lions, seals, eagles, and even a sea otter! Our guides, Mel and Jon, were fantastic: very knowledgeable about the area and its wildlife, and just all around wonderful people. A couple people on our trip hadn't kayaked much before, so don't let inexperience dissuade you - the guides are helpful and patient. We had a 12 person group (including the 2 guides) and everyone was delightful. The campsites were very nice, as was the kayaks and equipment. The guides prepare all the food, which is delicious, and are also very accommodating for vegetarians. Could not have asked for a better trip. Established in 1993, ROW Sea Kayak Adventures was born out of a desire to share the incredible wildlife experiences to be had from a sea kayaking outing. With a wide variety of trips to choose from, all of which are led by highly qualified guides, ROW Sea Kayak Adventures provides incredible experiences with every outing. What Makes ROW Sea Kayak Adventures Stand Out? While their parent company, ROW Adventures caters to a wide range of travelers, destinations, and styles, ROW Sea Kayak Adventures keeps it niche. They specifically focus on ocean based adventures - sea kayaking and whale watching are some of the main activities. For the many diverse destinations ROW travels to, sharing history, culture, and natural history information is an integral part of the experience. Known for excellent cuisine (yes even while camping! ), all ROW guides are well taught cooks; local ingredients and traditional meals are highlighted whenever possible. Who Will Enjoy Traveling with ROW Sea Kayak Adventures? These trips are best suited to travelers who enjoy being outside, and are looking for a tour that combines the adventure of sea kayaking with cultural outings and other traditional travel activities. You will be on the water among the salty and windy sea air for a majority of the trip, so a sense of adventure is key! Sea Kayaking is an exhausting but exhilarating activity - suitable to many ages and physical levels. But beware - if you are not a regular gym goer, the muscles activated when you kayak are going to burn the following day! That said, ROW is well known for impressively well rounded itineraries - you’ll have some time to rest as you explore areas of cultural and historical interest, and on some trips you’ll be treated to premium accommodations. They are popular among families, couples, and those in the 50+ range. Tours are available all over the world in Tours in Baja, British Columbia, Cuba, Quebec, Alaska, the Galapagos Islands, Corsica, and Scotland. Tours with ROW Sea Kayak Adventures are led by an experienced guides in top of the line kayaks, which are frequently updated to maintain the highest safety standards. While sea kayaking has a small learning curve, these trips do not require prior experience. That said if you are somewhat physically fit and able, you will find the trip more enjoyable. Expect some sore arms, but if you go in prepared for an adventure you’ll have an amazing time. Family friendly trips are available for extra little adventurers! Accommodations are largely camping based, however trips that stay in lodges, as well as cruises are also available. Why Choose a Tour with ROW Sea Kayak Adventures? Sea Kayaking toes the line between “hard adventure” and “soft adventure” in the travel realm. Depending on the weather, for example, a destination that might traditionally offer easygoing kayaking can suddenly become super challenging. That’s why traveling with the experienced guides at ROW is a huge plus for your sea kayaking journey. The wildlife viewing opportunities and up close encounters on ROW Sea Kayaking trips is definitely one of the highlights. It’s also a great way to meet other like minded adventurous travelers. ROW Sea Kayaking trips are small, expertly guided excursions designed to inspire and provide a great experience at great value. 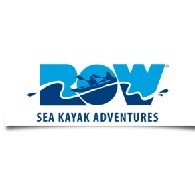 ROW Sea Kayak Adventures, founded in 1993, was born out of a passion for whale watching, sea kayaking, and wanting to share the experience with fellow nature-lovers. For over 20 years now, Sea Kayak Adventures has been providing unique kayak tours for active, outdoor-minded travelers to world-renowned destinations and some of the most celebrated natural areas, including Alaska, British Columbia, Baja, the Galapagos Islands, Patagonia, Quebec, Scotland and Corsica. Each destination has its own unique wilderness experiences and most offer once-in-a-lifetime wildlife encounters. Travelers head home at the end of their trip feeling rejuvenated by their time spent in nature, meeting great people, kayaking amidst wildlife and sleeping under the stars. At ROW Sea Kayak Adventures, we select the very best places on Earth to whale watch and sea kayak. And we don’t just watch whales; we join them! Many of our trips are in UNESCO World Heritage Sites and National Marine Parks, providing unparalleled whale and wildlife encounters, and calm paddling waters. Kayaks are largely non-intrusive to wildlife, which mean you’ll have a rare view of animals that normally scatter at the approach of humans and large boats. In sturdy kayaks you’ll be at eye level with playful dolphins, inquisitive sea lions, and incredible whales. Most of our guides are with us for the long-term, despite the seasonal nature of the industry. Our top-notch equipment, unique itineraries, and perfected operations attract extraordinary guides, many of whom are highly sought after in the industry. ROW Sea Kayak Adventures guides know their outdoor skills as second nature. Each trip has 2-3 guides to assist, inform and lead the way so you get the most out of your adventure. They love to share conversations, knowledge, games and laughter – and they’re great cooks! While we provide certain creature comforts, we are all about practicing “Leave No Trace” ethics. Respecting not only the wildlife we encounter, but also the environment we visit is of utmost importance. Rest assured you will leave the special places you visit as pristine as you found them. In 2013, we furthered our conservation and responsible tourism efforts by becoming the first kayak tour operator to join the Responsible Whale Watch Partnership. We represent the organization with just 30 other companies in an effort to raise the standards of whale and dolphin watching worldwide. We make unique and meaningful trips easier for you by taking care of the details so you can just show up and focus on being totally engaged in your adventure. You'll even find a historic element on this wildlife and nature tour. Mid-way around the island, you'll make a brief stop at Salinas Bay to visit an abandoned 19th century salt mine and coral chapel. A two-day paddle rounding the island’s remote north shore leads to Balandra Bay, where you can hike an arroyo into the island’s desert interior past saguaro-like cardon cactus and wild figs in the company of desert iguanas and big-horned sheep. From your tented camps in sheltered coves, watch vermillion skies as they illuminate the banded layers of the Sierra de la Giganta range, the plume of a whale lingering in the still air, and leaping manta rays flopping back into the glassy water as guides dish out margaritas and tasty chili rellenos.